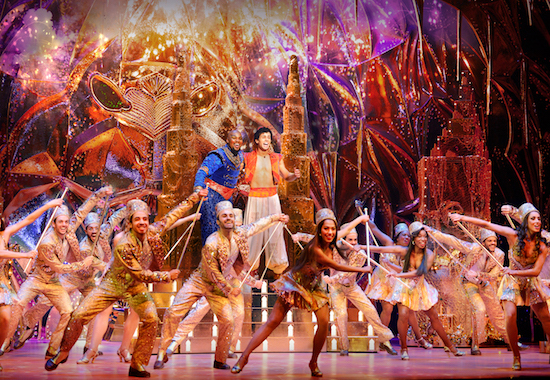 Disney’s Aladdin, one of the largest and most spectacular productions to ever grace an Australian stage, will depart Sydney and arrive at Her Majesty’s Theatre in Melbourne, with performances from April 15. Based on the Academy Award-winning animated film and produced by Disney Theatrical Productions, Aladdin features music by Alan Menken , lyrics by Howard Ashman, Tim Rice and Chad Beguelin, with a book by Beguelin, and is directed and choreographed by Casey Nicholaw. The principal cast features Michael James Scott in the role of the Genie, Ainsley Melham as Aladdin, Hiba Elchikhe as Jasmine, Adam Murphy as Jafar, Aljin Abella as Iago, George Henare as the Sultan, Adam Jon Fiorentino as Kassim, Troy Sussman as Babkak and Robert Tripolino as Omar. With a cast of 34, and a staggering 337 glittering costumes, 1,225 different fabrics, 712 different styles of beads, almost 500,000 Swarovski crystals, Aladdin promises to be the largest and most spectacular productions in Australia to date. Forty tonnes of exotic flying scenery and 60 tonnes of automation and staging have been built into Her Majesty’s Theatre to recreate the fantasy city of Agrabah including the colourful marketplace, the lush palace of the Sultan and his princess daughter Jasmine and the legendary Cave of Wonders. Aladdin, adapted from the Disney film and centuries-old folktales including “One Thousand and One Nights,” is brought to fresh theatrical life in this bold new musical. Aladdin’s journey sweeps audiences into an exotic world of daring adventure, classic comedy and timeless romance. This new production features a full score, including the five cherished songs from the Academy Award-winning soundtrack, and more written especially for the stage. Aladdin opened on Broadway to critical acclaim on March 20, 2014 and quickly established itself as one of the biggest new blockbusters in recent years, breaking 11 New Amsterdam Theatre house records and welcoming over 4 million people worldwide. Its global footprint has expanded to include productions in Tokyo, Hamburg, London and Australia with a North American tour launching in Chicago this month.